In Pictures - How Switzerland won me over with its fleeting winter charms! ~ The Wandering Soul's Wander Tales.. In Pictures - How Switzerland won me over with its fleeting winter charms! As ironic as it sounds, warming up inside an igloo set on the banks of a frozen lake in the Bernese Alps of Switzerland, I tightened my grip around the warm cup of tea silently wondering if I'd do this again - visit Europe in winter. Europe's not really my thing but when an invitation to visit Switzerland in winter arrived, I was slightly intrigued. Switzerland is an incredibly beautiful country without a doubt but the incredibly organised and well-explored tourism of Europe is not my cup of tea. Also, I think the inescapable aftereffects of DDLJ ruined it for me. However, as a huge proponent of off-season travel, I got on the plane to Zurich in hopes of seeing a new side of the insanely popular country. Few days later, there I was in that igloo reflecting on the winter beauty of Switzerland despite barely scratching the surface. When I visited Bernese Oberland region of Switzerland last winter, I was quite looking forward to the trip even though the famous alpine greenery was long gone. Partly because I was about to get a glimpse of quintessential European winter life. My idea of surviving snowy winter doesn't extend beyond warm quilts, hot cups of tea and views from window sills despite being an outdoor buff. But the Swiss taught me there's no weather that warrants self imposed indoor confinement. While ice fishing on Hinterstockensee lake, zip-lining on Grindelwald First, chugging down unending glasses of warm Glühwein inside igloos, sledding down on the slopes beneath the iconic Eiger and several unsuccessful trials at ice skating later, I learned how easy it is to enjoy the cold and gloomy winters, like the Swiss do. I had fun. But I wasn't fully impressed yet. I’m not used to in-your-face kind of natural scenery. I prefer long chases that require exhausting efforts to get to places of sublime beauty. I like having a view entirely to myself, as if it’s a secret between nature and me; it makes the moment special to me. Naturally, it took some unlearning before I could appreciate the abundance of stunning views everywhere in Switzerland - be it from my room balcony or from a random cable car station. This country looks pretty without even trying! But that’s not news to any of us, you and I already know Switzerland is beautiful. So how I fell for its charms is a matter of pure happenstance! Between days packed with the usual sightseeing fare, I was involuntarily drawn in through fleeting moments of sheer brilliance. 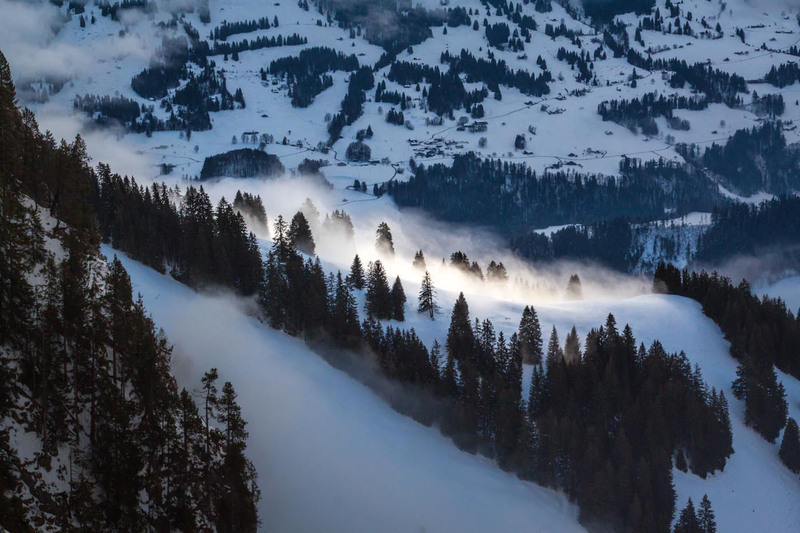 A sea of fog rolling ever so gracefully over a whitewashed hill in Simmen valley. The ethereal glow of winter’s subtle rays lighting up a mountain I saw on a train ride. The artistry of a layer of snow that’s capable of hiding every ugliness in sight. A bright but transient snow plume leaving the slopes of Eiger. 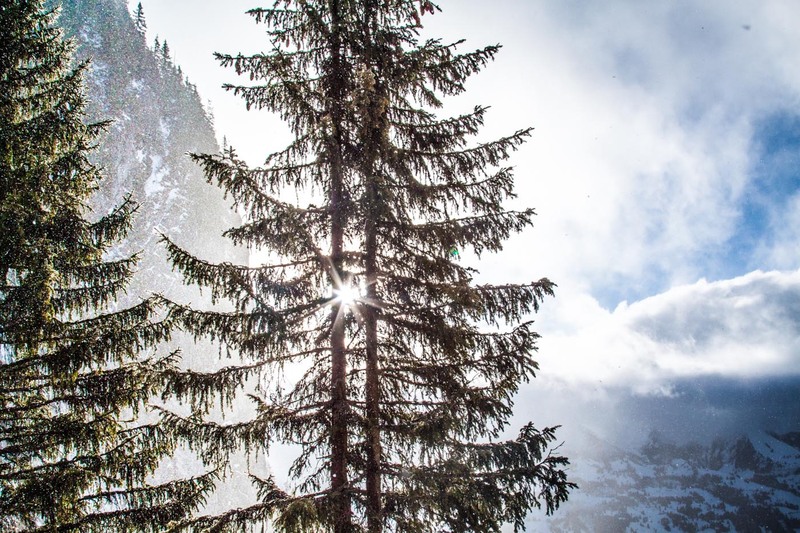 The collusion of sun, snow and Swiss pines creating a spectacle that could surpass the best of our imagination. It came as a revelation last week that it was the impermanence of these moments that sealed the deal for me. Those were mine, special to me. We all travel for different reasons. My reasons never include sightseeing or ticking off things from a crowd sourced "must-do" checklist. I care little for popular sights and activities but I’m a sucker for stories, surprise and serendipity - none of those can be arranged in advance. No wonder then that I came back slightly underwhelmed. But now looking through my images, I can feel a sense of wonder filling my head. Memories of fleeting beauty flood my mind, creating a overwhelming urge to return, in winter once again perhaps. The joy of suddenly discovering a connection is incomparable; it’s like renewed friendship or love at second sight. Turns out the best way to find magic in the mundane at times is to just give in to the flow and not fight it. In this case, it meant I had to go against my instinct and play tourist to fall in love with Switzerland! Here's a glimpse of the magic that has me enraptured, in pictures because words always fail me when it comes to nature. Cable car from Chrindi station heads towards Stockhorn peak, Simmental Valley. Cable way to Stockhorn peak shrouded in mist. Ending with a view of snowfall in Switzerland! Note: My trip to Switzerland in winter was made possible by Interlaken Tourism and Jungfrau Railways. So tell me, would you visit Switzerland in winter? Or is summer more appealing to you? I can so relate to 'But now looking through my images...'. Happens to me too. I come from some place, unimpressed (or underwhelmed as you have said) so much so that at times don't even work on the images and then, few months or a year down the line while accidentally going through the photos, I notice 'magic in the mundane'! Fairy tale houses is my favorite and love the starburst in Jungfraujoch. It was candid neelima, both your thoughts and the pics !